Janik is an experienced trial attorney with a specialized practice in complex litigation, tax controversies, cybersecurity, privacy and data protection. Janik advises clients on cybersecurity issues including breach preparedness and breach response. He also counsels clients in the areas of investigations and corporate compliance, employee privacy, data protection and social media. He is a former trial attorney with the U.S. Department of Justice in Washington, D.C. and a Certified Information Privacy Professional/United States (CIPP/US). 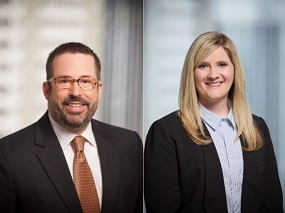 Stanton advises business entities and individuals in evaluating and managing risks associated with privacy and data security practices, including incident readiness and response. She counsels clients on state and federal privacy and data security requirements, including structure and implementation of privacy policies and programs and assist clients on various information security and privacy issues, including security breach notification laws, information governance issues and vendor management procedures. Stanton is a Certified Information Privacy Professional/United States (CIPP/US). The Arkansas Bar Association advances the Administration of Justice. It fosters and maintains on the part of attorney’s high ideals of integrity, learning, competence and public service, and high standards of conduct. The Arkansas Bar Association encourages the legal profession and its individual members to perform more effectively and efficiently their responsibilities in the public interest. It conducts a program of continuing legal education for attorneys and provides a forum for the discussion of subjects pertaining to the practice of law. It also improves the judicial and legal process, and advances law and order. Mitchell, Williams, Selig, Gates & Woodyard, P.L.L.C. is a full-service corporate law firm that provides comprehensive, strategic legal services to help clients achieve their goals. Established in 1954, the firm has offices in Little Rock, Rogers and Jonesboro, Arkansas and Austin, Texas. For more information, visit MitchellWilliamsLaw.com.